The EDPT is used for two Air Force Specialty Codes: 9S100 and 3D0X4 and the USMC Military Occupational Specialty (MOS 4034). It's mostly logic type problems. It's tough, long, and you have to go quick. The use of nuclear weapons anywhere in the world has an immense impact on our nation’s policies. It’s the job of Scientific Applications Specialists to discover clues that have been left behind in order to detect when a nuclear weapon has been tested. Utilizing skills in mathematics, electronics and physics, these experts gather and analyze data to ensure we know when and where nuclear capabilities are being used, giving us the knowledge we need to take action when necessary. 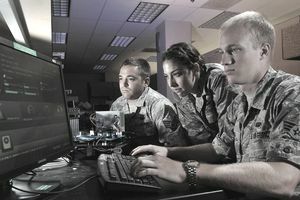 The Air Force requires countless computers to accomplish mission 24/7. The computer and the system / network is only as good as its software and the people who operate it - Computer Systems Programming Specialists. These professionals write, analyze, design and develop programs that are critical to our war-fighting capabilities - from maintenance tracking programs to programs that organize and display intelligence data. The Marine Corps needs smart IT guys too. Someone trained and skilled to monitor and control electronic computer and data processing equipment to process business, scientific, engineering, and other data according to operating instructions is a job responsibility that would affect the entire Marine Corps if it did not operate properly. When other Marines encounter problems, these IT Marines must be able to diagnose issues over the phone and assist computer users. Being able to enter logic commands, using computer terminal, and activate controls on computer and peripheral equipment to integrate and operate equipment in order to help programmers and systems analysts test and debug new programs. The EDPT is administered at the Military Entrance Processing Station (MEPS) during your day at processing. There are approximately 120 questions to be answered in a period of 90 minutes. All questions are multiple choice with five available answers for each. It is a paper and pencil test, not computerized, and the testing personnel provided me with two sheets of scratch paper and a pencil (calculators are not allowed). The test was divided into four parts: analogies, arithmetic word problems, sequencing and patterns, and pictorial analogies. The analogy questions are just like those given on the SAT - _____ is to ______ as ______ is to _____. One needs to determine the relationship between the first two words and find the answer that has the same relationship to the third word given. The arithmetic word problem questions are just that -- word problems. The questions incorporate a lot of extraneous information into the wording and one has to be able to pull out the information needed and discard the garbage. The questions themselves did not require an extremely high level of mathematical ability (algebra, some geometry and maybe a tiny knowledge of physics), though each test form could differ in the types of questions given. As in any other Multiple Choice test, one could probably eliminate one or two answers quite quickly and then plug the remaining answers into the equation to determine the correct answer. This method takes a while longer, so wait until all easier questions have been answered and go back at the end if time remains. The sequencing and patterns portion of the test was my favorite. Either four or five numbers are given and then a blank space in which you must provide the next number in the sequence. "3 9 4 16 11 _____"
Therefore, for the above example, the pattern would be "3 (x 3) 9 (-5) 4 (x 4) 16 (-5) 11 (x 5) 55." By writing the possible sequences down on the scratch paper, it becomes much clearer and one can see the pattern much more quickly. There were no tricky fractions or other strange patterns on the test -- just adding, subtracting, multiplying and dividing integers to the previous number. Tithe last type of question on the test are the pictorial analogies. Just like the analogies portion, questions are in a form similar to _____ is to ______ as ______ is to _____. The difference is that geometric shapes are used and one has to determine which of the multiple choice answers matches the third shape in the same way the second picture matches the first (Guide Note: See the example at the top-right of this page. In the example shown, the correct answer would be #2, as it matches object 3 in the same way that object 1 matches object 2.) Some of them will be rotated, cut, or otherwise manipulated, but there is always a reasonable relationship. Do not expect to be able to answer all the questions on the test. A quick look at the number of questions and time allowed shows that one has only about 45 seconds per question and many of the word problems require at least that much time just reading and deciphering what information is necessary, then putting the data into a workable problem. It is recommended to answer all the easier questions first, then (time permitting), go back and start working on the harder ones.In the Air Force, a score of 71 is needed for the AFSC of computer programming (3D0X2) and 57 for Technical Applications Specialist (9S100). The test has nothing to do with either job at first glance, but what it does accomplish is determine one's ability to think logically. All four parts of the test require the recruit to think logically and that is essentially what computer programming is.